Henin swept to victory with a superb display in the deciding set in Stuttgart. (CNN) -- Former world number one Justine Henin won the first tournament since her comeback as she beat Samantha Stosur of Australia in the final of the WTA tournament in Stuttgart on Sunday. The Belgian ace, who returned to the tour after an 18-month break in January, beat Stosur 6-4 2-6 6-1 to finally make the breakthrough after being beaten in two previous finals this year. 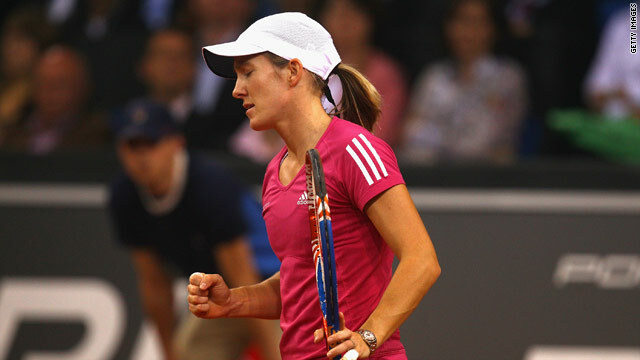 "It's very emotional for me to win here," said Henin, who claimed the Stuttgart crown in 2007. "I never thought I would be back here again, not even a year ago. "I have had a fantastic week and I can now say I will try to be back here next year," she told the official WTA Tour Web site. Henin, who is a seven-time grand slam winner, revealed that watching Roger Federer claim the French Open last year had inspired her own comeback. "To see Roger win the French Open last year, and keep fighting so hard, brought back the fire in me which had not been there for a long time before," added Henin. The 27-year-old will now target her fifth French Open crown on the clay of Roland Garros later this month and will be cheered by her win over the in-form Stosur, who won in Charleston last week. "It's been a nice feeling to get into the final, but Justine was a bit too strong for me," Stosur told AFP. After the first two sets were shared, Henin gained the crucial break in the third game of the decider for a 3-1 lead. Two further breaks gave her the title on the indoor clay in some style, the 42nd of her noted career.